Six years ago, actually six years and a month ago, I first heard the name InCoWriMo for the first time. 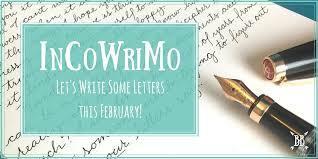 InCoWriMo means International Correspondence Writing Month. The month is February and the objective is "...to send a handwritten letter every day for the month of February to a person on the list. It doesn't have to be a novel or even news, it's entirely up to you what you write." The key word in that quote, taken from a blog post on the InCoWriMo 2019 site, is handwritten. 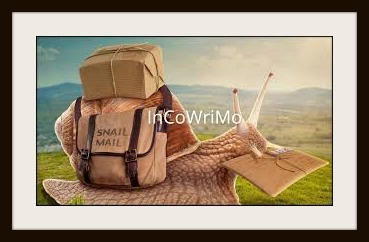 The snail mail logo is more than a cute picture. It is reminder to slow down, reach out and get in touch. I don't know of a better way to do that than write a letter - a handwritten letter. I began writing letters fifty years ago when I served in Vietnam. When I first read about InCoWriMo, I jumped at the chance to get back into it. I quickly discovered that the magic was still there. when I heard about it. I thought about waiting to 2015 to participate, but decided it was too good to wait a year for, so I jumped in and caught up. I haven't missed a year since. Many of the people I've met through letters have become my good friends, and I expect many more will. I have pen friends in Thailand, the United Kingdom, Canada, Netherlands, Taiwan, and the United States. I just assembled my 2019 InCoWriMo mailing list, and it includes individuals in Germany, France, Hong Kong, Israel, Macau, Kuwait, India, Mexico and the U.S. All of the information for this year's event is here. If you don't know whom to write to, a list of individuals who would love to hear from you is here. A fine aim in a month that tends to be dark and cold.it will brighten days. Quite a while back I began keeping in touch with my grandma once every week. She wasn't via web-based networking media, so it was an extraordinary method to stay in contact. She was of an age which composed a ton of letters, so when I made inquiries she would compose back. I figure I will utilize my overabundance of stationary (and those note-cards philanthropies continue sending) to compose my relatives and see what sort of stories I hear back. That is beautiful. When I was 14 my family moved five hundred miles from our immediate family. My mother became the family scribe, answering all the letters from my grandparents and aunts and uncles. When a letter arrived from home it was an event. At dinner, Mother would read the letters and later compose and mail an answer. Much later, in Vietnam, I saw the power of mail call. Now, at age 76 I still get excited when I read and answer my mail. I just don't get that excited about an email or text or phone call. Enjoy the correspondence and thanks for telling us about it. Extraordinary idea! I love it, the perfect reverse of our digital age, what a beautiful way to break off!